Technical Features: Electrically conductive Ester based polyurethane hose reinforced with a PU coated steel wire to ensure a high adhesion. 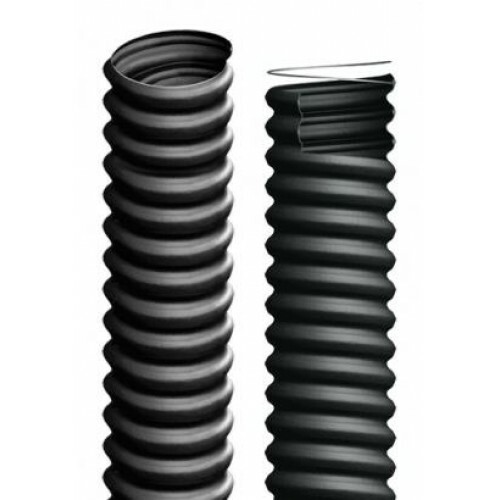 The constant wall thickness of 1.5mm for the whole diameters range makes the ducting suitable for heavy duty applications. Smooth bore to ensure optimum flow characteristics. Properties: Raw material with permanent electrical conductive features R<10⁴ Ohm/metreaccording to ISO 8031. Flexible, excellent resistance to abrasion, most chemicals, UV rays, ozone. Halogens free conform to RoHS Regulation. Standards: The Electrical resistance R<10⁴ Ohm/metre meets the requirements of ATEX, ISO 8031, TRB S 2153. The product is suitable for all those areas where electrical conductivity is demanded (mechanical, hydraulic, pneumatic and electrical equipments used in potentially explosive athmospheres). Suction of gasses, fumes, and transport of abrasive materials, such as granules, dust and powders.